Color manipulation is an important part of working with POV-Ray SDL. qtpov provides some support to assist with colors. Currently, qtpov only understands the rgb[ft]<> syntax. If you hover over an rgb[ft] token, a tooltip will display the color. The Color Editor is activated via a context-click (right-click). If the cursor is over an rgb[ft] token, that color is parsed and edited, otherwise a new color is created. The Type buttons control the POV-Ray color type. 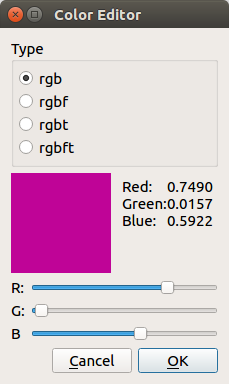 The center contains the color swatch, and the effective RGBFT values for the current color. Note the Filter and Transmit values are shown if applicable. Click on the swatch to open a standard color chooser. The bottom sliders allow you change the values of the color.